Robin was born the youngest of four children and was special to each member of his family in his own way. Even if it was just the fact that he was the “baby”. 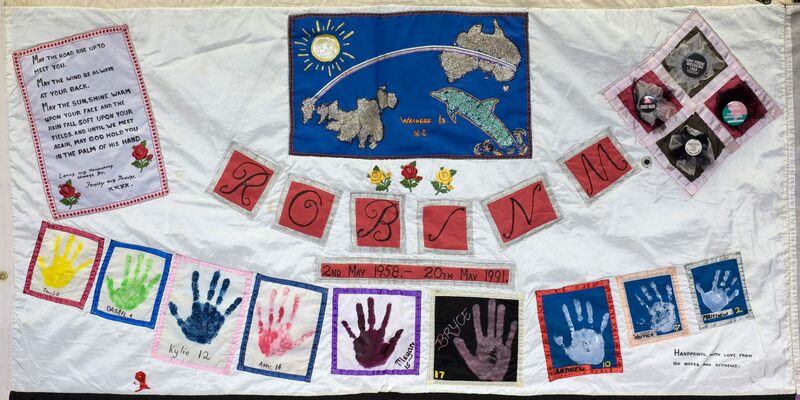 Robin’s Quilt has been designed to represent the many areas of his life. Firstly, Waiheke Island, where he was born and lived until he was 10 years of age. It was here that he developed his love of the sea and the sun. The sun, another area shown on his Quilt. He lived for the summer, the beach and water. A rainbow is shown also, this represents his travel to Australia, where he lived for 12 and a half years. He spent time in America as well. Robin loved wildlife, in particular, endangered species. He had a real affinity for dolphins and we believe, as his family, if there is such a thing as reincarnation, then a dolphin is what he would choose to be because he would be free and always in the sea he loved so much. The panel on which these five areas are shown is bordered in the tartan ribbon. This represents his Scot ancestry. Robin’s name has been created in red and black, these colours for his North Sydney Football League team. A supporter of the “Bears” in a big way. The lettering for his name edged in silver ribbon, both for his favourite jewellery and colour. Robin was a badge collector, and from his collection, we chose four to display on his Quilt, both for their significance and because he was not ashamed to say he was gay. Nor are we, his family. These badges we fashioned into buttons with tulle because he loved “those tulle numbers”. The handprints from his nieces and nephews are from “his children”. These children represent a generation who we hope will be more tolerant of people, no matter who they are or what they are. They also represent nine children who will be well-informed and educated on HIV and AIDS awareness. Megan’s and Bryce’s handprints are under his birth and death dates because this too is of significance. Megan was born on Robin’s 18th birthday and Bryce had to be told his beloved uncle passed away on his 17th birthday. The verse represents how much he was loved and is missed and how now as we are not able to care for him, God will. We as a family wish for Robin to be remembered for his love of life, all life. His caring for those less fortunate than himself, when he was able. Also the fact that he volunteered for two “guinea pig” programmes at Saint Vincent’s Hospital in Sydney in the hopes that others would benefit from this, in the worldwide search for a cure for his disease.